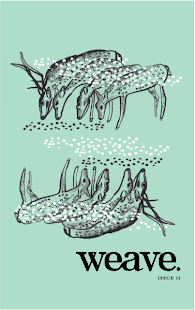 cover credit: Random House, LLC. Pomegranate Soup by Marsha Mehran is an intriguing narrative with a dash of wonder and one-too-many sprigs of enchantment. She gradually unfolds the co-dependent Aminpour sisters’ tale of evading mysterious pasts and a desperate attempt to establish a safe home in the small Irish town of Ballinacroagh. While there, Marjan, Bahar, and Layla rent a small cafe from an Italian landlady, Estelle, and introduce their secluded town to cultural cuisine. This results in both trusting friendships and despicable prejudices. The Iranian, Irish, and Italian cultures are depicted only through language and food. Mehran created strong, distinct voices through realistic vernacular from Estelle and the Irish citizens. However the Aminpour sisters don’t present dialogue cadences. Instead, they use the same language structures as the narration: American. This could be an attempt to make the sisters as “normal” as possible for American readers and set them apart from other characters. Mehran explores the sisters’ “otherness” further through their experiences with prejudice from the town gossip, close-minded society women, and the town bully. Although the sisters are never questioned about running a business without a man, the town (and author) focuses on their ethnicity. Among earlier instances of indirect prejudice, Bahar encounters hatred when she is angrily shunned by the butcher’s wife and men in a bar while trying to find Layla one evening. “Something was very wrong here…. Something that went beyond the sad little curiosities of the old women in the butcher’s. Whatever she thought of that kind of small-mindedness, it was nothing compared to the bald hatred before her. It was an exclusion as foul as she had experienced in those scary early years in London, when the whole city was under alert of terrorist threats, and anyone who looked slightly foreign was watched with suspicion. Turning on her heels… Bahar pushed through the pub door, anxious to escape the dread that was rising in her chest. Just as the door slammed behind her, a sinister voice called out: ‘Go back to yer stinking camels!’ Raspy smokers’ laughs enveloped the rest of the smarting insult” (140). The commonness of that insult connects with the characters, which mostly represent tropes. Bahar is fully developed and the overall story arc seems to center on her. Her abusive past resulted in mistrust of men, in addition to severe migraines triggered by fear and any conflict. She is constantly on edge, and her post-traumatic stress is enough to make readers want to hug her and hand her a bowl of abgusht and a cup of tea. Because of this, readers will find common ground with Marjan. The narration follows her reliance on general kindness, food, and drinks as attempts to provide comfort. They also counteract her ineptitude of protecting and guiding her sisters. And, to ensure that they’re accepted in town, she uses her peculiar gift of making inspirational meals. “Through her recipes, Marjan was able to encourage people toward accomplishments that they had previously thought impossible; one taste of her food and most would not only start dreaming but actually contemplate doing (78). … Evie and Fiona sat at one of the window-side tables now, each drinking her own bowl of red lentil soup as vague ruminations—prompted by Marjan’s magic—swam in their heads: Evie could see neon pink letters spelling out her name over the salon’s door, while Fiona imagined hers lighting up a theater marquee once again” (89). But this relates to Mehran’s inability to remove excessive ingredients after her dish has been plated and served. Although Marjan’s cuisine provides a touch of magical realism, other poorly integrated fantastic elements cause hiccups. For example, Layla’s supernatural musk of cinnamon and rose is just enough for readers to suspend disbelief and enjoy the story. But Mehran unnecessarily explains the scent by killing the sisters’ mother in childbirth. “Layla never knew her mother either, for she died shortly after pushing her out into the harsh world… The weary doctors in Tehran General Hospital had no explanation for the merciless bleeding and just shrugged with defeat when they told her father the news. They failed to mention that, as the last drops of blood seeped into the hospital’s sea green bedsheets, a tiny bud had popped out of his wife’s womb. When the flower seed fell into the pool of blood, it blossomed into the face of a full-grown rose. The fearful doctors kept this to themselves, partly to avoid a malpractice suit, and partly because the rosewater and cinnamon scent that accompanied the flower’s miraculous unfolding reminded them of a time when military guards did not hover behind every surgery room door” (29). The background of the mother dying will gain readers’ sympathies, and it’s easy to believe that Layla’s natural musk is due to Marjan’s constant cooking with exotic spices. But a rosebud causing fatal hemorrhaging represents an elaborate need to appeal to readers, which tarnishes the story. 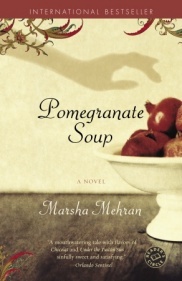 But Pomegranate Soup isn’t just a novel about family and finding a safe home; it is also, surprisingly, a cookbook. Each chapter is prefaced by recipes, and the rich descriptions of ingredients will make readers salivate. Overall, the novel provides enough intrigue and simplicity to keep readers turning pages without much thought. It will succeed when readers wonder if they, too, live in a provincial town that needs a bit of spice.